PARIS, France (3rd UPDATE) - A massive fire consumed Notre-Dame Cathedral on Monday, gutting and destroying the roof of the Paris landmark and stunning France and the world, but firefighters said they had saved the shell of the stone structure from collapse. "We now believe that the two towers of Notre-Dame have been saved," Paris fire chief Jean-Claude Gallet told reporters at the scene. "We now consider that the main structure of Notre-Dame has been saved and preserved." World leaders expressed shock and sent condolences to the French people. President Emmanuel Macron said the whole nation was distressed. "Like all our compatriots, I am sad this evening to see this part of all of us burn," he tweeted. A centuries-old crown of thorns made from reeds and gold and the tunic worn by Saint Louis, a 13th century king of France, were saved, Notre-Dame's top administrative cleric, Monsignor Patrick Chauvet said. But firefighters had struggled to take down some of the large paintings in time, he said. The Paris prosecutor's office said it had launched an inquiry into the fire. Several police sources said that they were working on the assumption for now that it was accidental. It is renowned for its rib vaulting, flying buttresses, and stunning stained glass windows, as well as its many carved stone gargoyles. 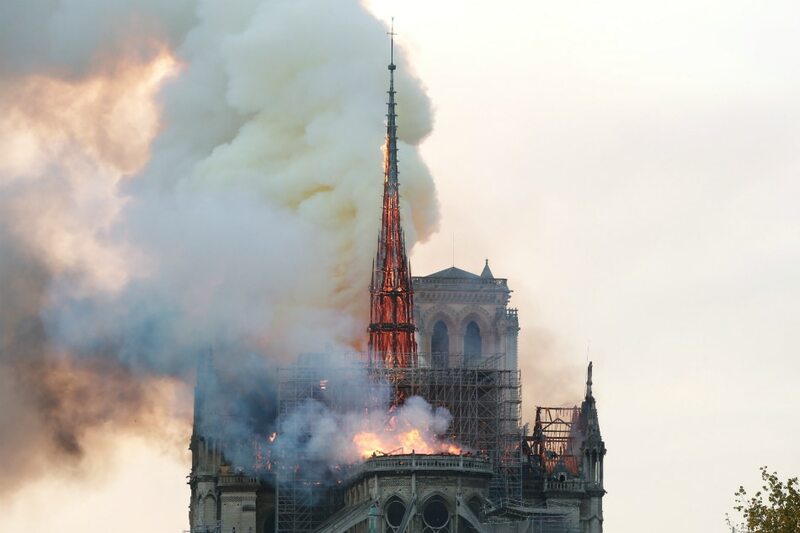 Its 100-meter-long (330-foot) roof, of which a large section was consumed in the first hour of the blaze, was one of the oldest such structures in Paris, according to the cathedral’s website. "Notre-Dame belonged to all humanity. What a tragic spectacle," tweeted Jean-Claude Juncker, president of the European Union's executive Commission. "What horror. I share the French nation's sadness."